Big League Clu reviews the Jets’ Week 2 loss to the hated Patriots. For the Jets, it seems like Week 2 was so long ago now, but none the less, we have to talk about that rainy, awful, good-for-nothing 13-10 loss that the Jets suffered against the New England Patriots in Foxboro on Thursday night. We now enter Week 3, and the New York Jets sit at 1-1 on the season. If you asked any Jets fan, they would probably be content with that record. I know I am. So let’s break down what went wrong for Gang Green in Week 3. Yeah, there’s no sugar coating here… the Jets offense was non-existent in this game. QB Geno Smith was bad, especially in the fourth quarter. In fact, he threw 3 of his 4 interceptions in that fourth quarter. The one bright spot in this game was running back Bilal Powell, who put up 48 yards rushing, caught 2 passes for 22 yards and scored the Jets only touchdown. And, even though Powell got the score and showed the overall better numbers, it is clear early on the Chris Ivory is the better back, as he shows more explosiveness off the ball. However, he also only ran for 52 yards. The Jets had a chance to get into field goal range and at least try to tie the game late in this contest, but, getting back to Geno and his 4 interceptions, his last one sealed sealed the fate of the Jets. Overall, Smith was 15 of 35 passing and only had 214 yards passing. Oh, and his 15.0 QBR (quarterback rating) certainly didn’t help his cause. Most importantly, Geno didn’t get the job done when he needed to in the fourth quarter and, ultimately, his 4 picks were the main reason why the Jets lost the game. Rant #1: What In the World Happened on Special Teams? Rant #2: Was the Fight at the End of the Game Really Necessary? Yep. that’s what happened in the final seconds of Thursday night’s game, everyone. It happened just moments after Geno Smith was intercepted by Aqib Talib to seal the Pats’ win with 38 seconds left to play. Talib waited a second to step out of bounds, almost like he was showing off, and maybe that’s why Jets offensive lineman Nick Mangold came in with an apparent effort to drive the Patriots cornerback out of bounds. 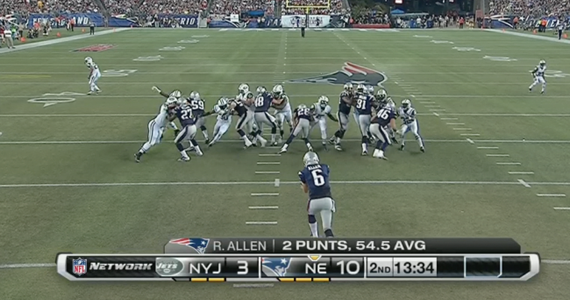 However, it looked like Mangold dove kinda low Talib, down near his knees. To make matters worse, it all transpired in front of the Patriots’ sideline. 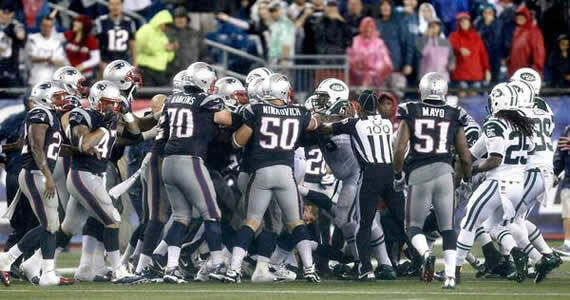 The Pats jumped at the opportunity to help Talib, and a brawl ensued. This is my issue here: the game was over. Geno had thrown his 4th pick of the game and the Pats weren’t really showboating either, so can I just ask why even bother with the late hit? After watching the video, since I had turned off the game by that point, I felt that it was just plain stupid. There was some pushing and shoving going on, and some ejections were handed out to some of the Jets players. Thankfully, no suspensions were given out to some of the players involved (Nick Mangold, D’Brickashaw Ferguson, and Willie Colon), but there will most certainly be fines to deal with. Just another low point for the Jets I guess. Welp, at least the Defense looked solid, ah? Also, let’s stay in an upbeat mood and mention the fact that the defense is getting a couple of key players back again for their Week 3 matchup against Buffalo. The Good news on Muhammed Wilkerson is that his injury was nothing severe, so he should be back playing D against the Bills. Even LB Quinton Couples looks like he might be coming back from that fractured ankle he suffered in pre-season. That will be a huge boost to an already solid defensive core. Jeremy Kerley also hopes to play Sunday, but will need to be cleared by doctors before he can do that. I mean shoot, he already declared himself 100% ready to play, so let him play, coach! Given that Stephen Hill has been such a bust, and Santonio Holmes is slowly making his resurgence, Kerley will absolutely help out on offense. He is a solid target for Geno Smith to throw to. Given that Buffalo had a nice come from behind win against Carolina, I look at this week’s game and have to say that this is a must-win for the Jets if they look to have any sort of success this season. Buffalo is hungry, though. They have gobs of talent on the offensive side of the ball and they also have an athletic rookie QB in EJ Manuel. They also have a dual threat at RB with CJ Spiller and Fred Jackson. Also, with Mario Williams on defense, they will most certainly be putting some pressure on the Jets’ offensive line. 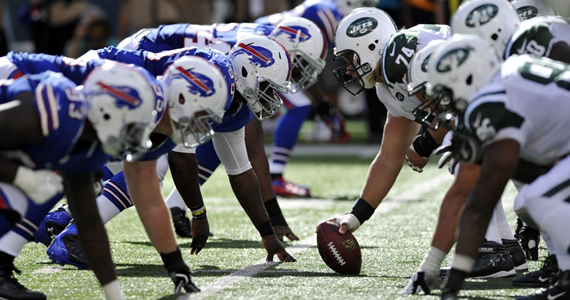 The Jets’ defense will be key, because they will have to control the tempo of the Bills’ offense. I like Gang Green in this game, and heres why: (this one if for all you fantasy goers out there) The Jets D has only allowed 25 points in the two games they have played so far. They’re good… It’s just the offense that makes you want to cry.